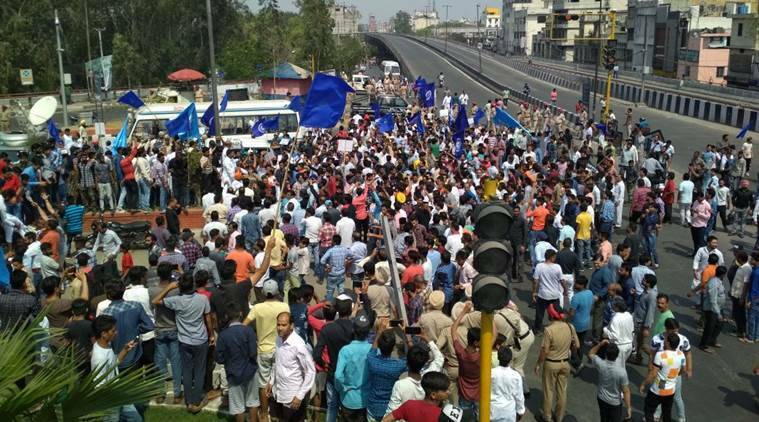 Follow Bharat bandh Highlights: Violent protests were reported in parts of Uttar Pradesh, Gujarat and Punjab, while curfew was imposed in parts of Madhya Pradesh. 19 people have been injured in Gwalior and internet services have been suspended. 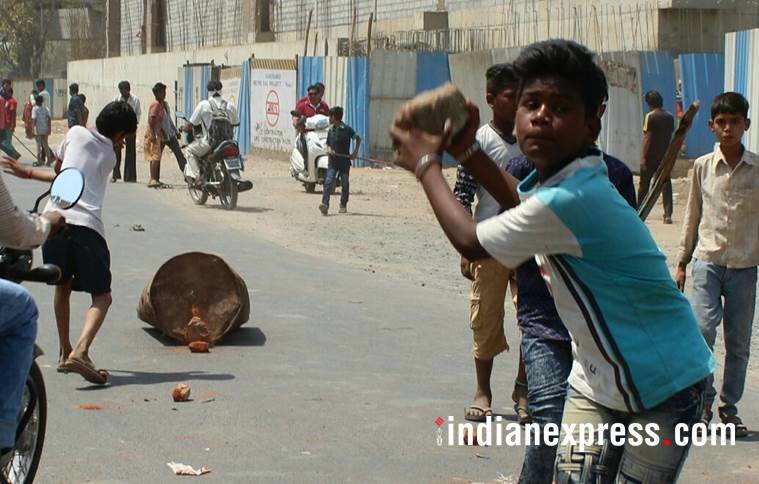 The nationwide bandh called by Dalit organisations on Monday turned violent as people resorted to stone pelting, damaging properties across various states. Seven persons were killed in violent clashes across the country. While four persons died in Madhya Pradesh, one died in Rajasthan’s Alwar and two died in Uttar Pradesh. Violent protests were reported in parts of Uttar Pradesh, Gujarat and Punjab, while Section 144 has been imposed in multiple parts of North India. The protestors in the morning blocked several trains in Bihar and Jharkhand, affecting railway services. Meanwhile, the government has moved a review petition in the Supreme Court today. Speaking to reporters, Union Law Minister Ravi Shankar Prasad said that the Centre has no intention of removing the provision of reservation for minorities. Congress chief Rahul Gandhi slammed the Modi government saying its attitude towards the minority community is derogatory. 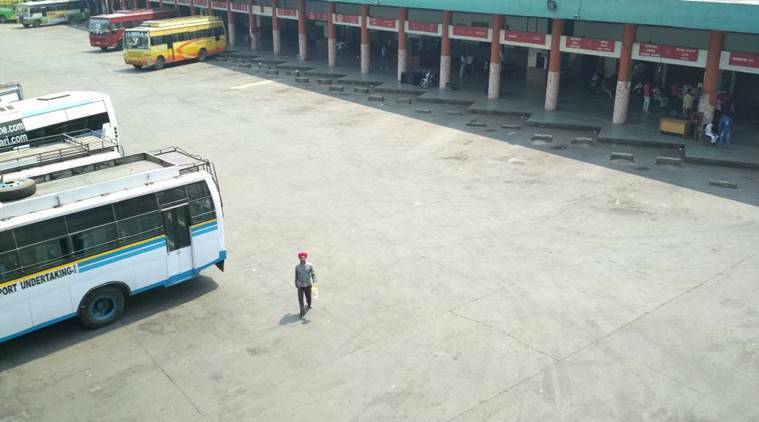 In Uttarakhand's Haridwar, section 144 imposed to prevent any untowardly incident in the aftermath of nationwide strike that turned violent on Monday. .. 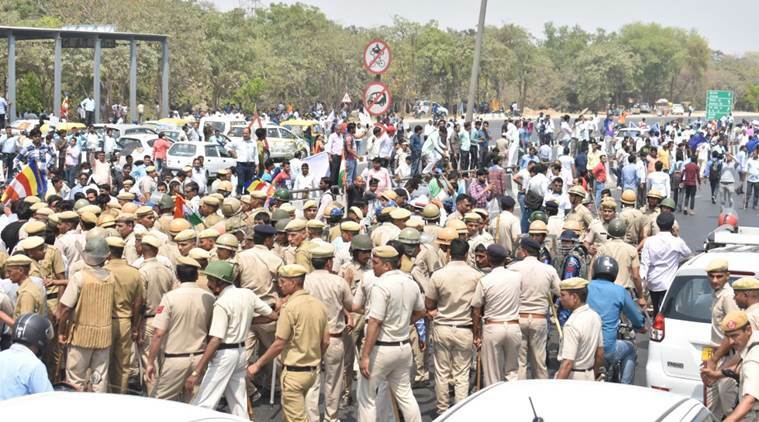 In the aftermath of protests turning violent on Monday, all schools and colleges (except those conducting board examinations) in Hapur and Ghaziabad, will remain shut on Tuesday. "Few unfortunate incidents took place today. Strict action will be taken against those responsible. I appeal to everyone to maintain peace and harmony, and not pay attention to rumors. It is government's responsibility to ensure safety and security of all sections of the society," said Madhya Pradesh CM Shivraj Singh Chouhan. #9Wupdate: Due to unrest in Chandigarh, Patna & Amritsar, we are waiving off penalties for date/ flight change, refund, no-show & fare difference (if any) on all confirmed tickets for flights to/out of these cities for travel on April 02, 2018. All schools in Agra from class 1 to class 12, except those conducting board examinations to remain shut tomorrow in lieu of protests over SC/ST protection act today, reported ANI. "I am deeply pained by the acts of violence and loss of precious lives in some parts of the country today during protests in context of the Scheduled Castes and Scheduled Tribes Prevention of Atrocities Act. The Govt. of India is committed to ensuring welfare of SC/STs and other weaker sections and also guaranteeing them full protection of law. The Govt. has already filed a review petition in the Supreme Court to maintain the SC/ST Prevention of Atrocities Act in its presents form. I appeal to all political parties to help in maintaining harmony among different sections of the society. I also appeal to the people, not to fall prey to rumours and false propaganda unleashed by mischievous elements. The Government of India has advised all states to maintain law and order and we are ready to provide assistance to any state that may require so," Rajnath Singh wrote on Twitter. 763 people detained in Ranchi district and 850 in East Singhbhum district of Jharkhand during the protests, reported ANI. One person dies during violence in Muzaffarnagar in Uttar Pradesh, reported PTI. "There'll be an inquiry on people spreading rumours on Social Media. The police have also detained 448 people for legal action. Only 10% of state was disrupted, there was peace in 90% of area," DIG, Law and Order, Uttar Pradesh said. Mallikarjun Kharge said the law had an impact on 23 per cent of the Indian population and alleged that "the government took this case lightly". He demanded that either an amendment be made in the Act immediately or a curative petition be made before the full bench of the Supreme Court. 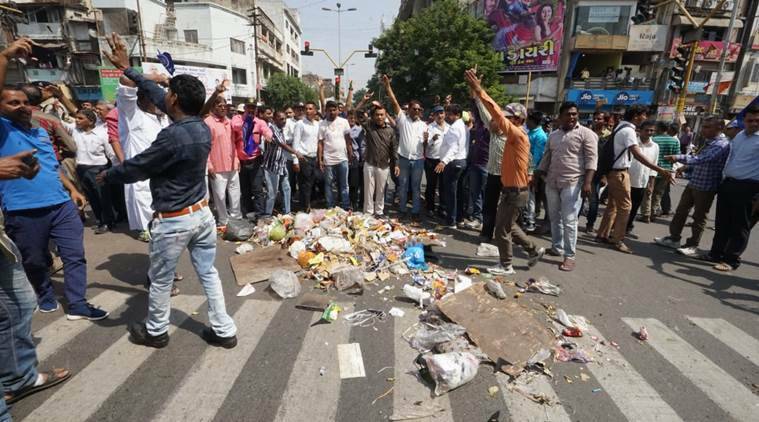 Both Azad and Kharge also regretted the loss of life and damage to properties during the bandh, saying the Congress never supports any violence. "I charge the central government, and not the Supreme Court, that this law was weakened and diluted because the central government did not represent the case properly before the court," Congress leader Ghulam Nabi Azad said. If the attorney general or additional attorney general had appeared before the court, the Supreme Court might not have taken the decision, he said. He also termed today's 'Bharat Bandh' as a success against "the government's failure and weakness," PTI reported. During the bandh call in Uttar Pradesh, 448 people were detained today. 35-40 policemen and 30-35 protesters injured in violence during bandh: DIG, Law and Order, Praveen Kumar, reported PTI. In Odisha, vehicular movement was affected in several areas, including Jharsuguda, Sundargarh, Malkangiri, Sambalpur and other tribal-dominated districts, the police said. Buses also remained off the roads at Biramitrapur, Malkangiri, Kalahandi and Bolangir. Shops and business establishments remained shut in several areas of tribal-dominated Malkangiri, Kalahandi, Sundargarh and Bolangir districts, the police added. Activists of the Adivasi Dalit Sena staged a rail roko at the Khetrajpur station in Sambalpur, which delayed some trains, they said. The bandh supporters stormed the Patna Junction railway station, forcibly closed the ticket counters and squatted on railway tracks, disrupting the movement of a number of trains. 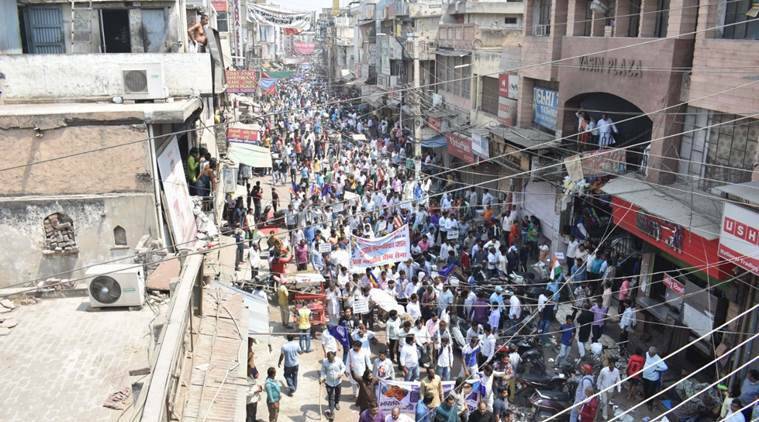 At the Bhikhna Pahari locality in Patna, students came to blows with the bandh supporters, who forced the closure of numerous coaching institutes in the area. Reports of rail traffic disruption also came from districts such as Darbhanga, Gaya, Jehanabad, Begusarai, Bhojpur and Araria. In Darbhanga, the bandh supporters stormed the premises of a court and indulged in vandalism of properties. The glass panes of a showroom were smashed by the agitators at Gopalganj. The protests in Purnea were notable on account of large-scale participation of women. The bandh supporters allegedly beat up the locals in Nawada, damamged the vehicle of a block development officer at Mokama in rural Patna and clashed with the police in Rohtas. The issue also rocked the state Assembly, which was adjourned till lunch break within minutes of commencement of proceedings. "We believe that Additional Solicitor General (ASG) representing the Central Government failed to defend the rights of the SC/STs in the Supreme Court for want of proper guidance from the central government," Assam Pradesh Congress Committee president Ripun Bora said in a memorandum to the Prime Minister. The Centre rushed 800 anti-riot policemen to Uttar Pradesh and Madhya Pradesh in wake of the violent clashes in both the states. Two companies of Rapid Action Force (RAF) personnel have been sent to Meerut and one company each to Agra and Hapur (all in UP), a home ministry official said. Two companies each of the RAF have been sent to Bhopal and Gwalior in Madhya Pradesh to assist the state administration in tackling the situation. Curfew was imposed in Morena, Gwalior and Bhind districts of Madhya Pradesh after a student leader died in firing and several others were injured. 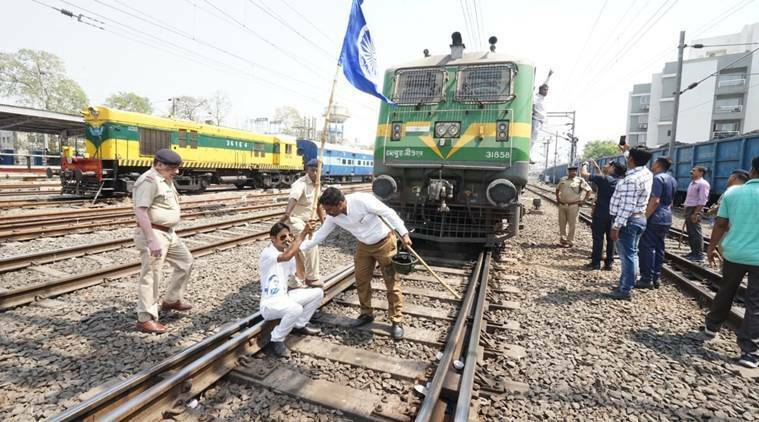 More than 100 passenger and mail train services were affected protesters squatted on the tracks and resorted to violence in Rajasthan, Odisha, Bihar, Uttar Pradesh, Haryana and Delhi. Many trains, including the Saptakranti Express, Utkal Express, Gatiman Express, the Bhubaneswar and Ranchi Rajdhani and the Kanpur Shatabdi, were stopped ahead of Ghaziabad at Meerut and Modinagar, Northern Railway officials said. A mob of about 2,000 people disrupted the train services at the Hapur station as well, they added. In the Agra Division, around 28 trains were delayed, including a Shatabdi and the Gatiman Express. At the Ferozpur yard, a mob of about 150 people arrived at 8:30 am, resulting in disruption in the movement of trains. Another mob of around 200 people disrupted the services in the Amritsar-Ludhiana section. Around 43 trains were affected in the East Central Railways (ECR) because of the protests, which started as early as 5:10 am in the Dhanbad division. In Bihar, the protesters stormed the Patna Junction railway station, forcibly closed down the ticket booking counters and squatted on the tracks. In the East Coast Railway (ECoR), around four train services were disrupted, with the protesters squatting in the Sambalpur and Khurda Road divisions as early as 5:15 am. Nearly 25-30 companies of additional forces were deployed across Rajasthan. Mobile internet services are also suspended. Section 144 has been imposed in Barmer, Jalore, Sikar and Ahore in Rajasthan. The district administration of Barmer imposed prohibitory orders after four cars were torched there. "Internet service was suspended as a precautionary measure and section 144 was imposed. Situation is now under control," Barmer District Collector Nakate Shivprasad Madan said. Praising the central government, he said it made the SC/ST (Prevention of Atrocities) Act more stringent in 2016 and celebrated Ambedkar's contribution with a number of measures, including by holding a special debate in Parliament and developing places associated with him. The protesters squatted on the railway tracks at a few places in Punjab and Haryana, paralysing the rail traffic, railway officials of the Ambala and Ferozepur rail division said. At Kaithal in Haryana, the protesters reportedly resorted to stone pelting and damaged a railway engine, police said. Kaithal police had to resort to lathicharge and lob tear gas shells to disperse the protesters, they said, adding around 10 policemen were injured in the incident. In Punjab's Bathinda too, the protesters turned violent. Two people were injured in a clash between the protesters and shopkeepers near Mehna Chowk. In Kapurthala, the protesters allegedly damaged about a dozen two-wheelers, smashed window panes of a lawyer's car and vandalised a chemist shop, police said. The Indo-Pakistan bus service, 'Sada-e-Sarhad', running between Delhi and Lahore was also disrupted. The Lahore-bound bus was halted at Sirhind and the Delhi-bound bus at Amritsar, police said, adding these buses will proceed to their destinations later in the afternoon. BSP chief Mayawati addresses media. Hitting out at the central government, Mayawati said, 'The attitude of BJP is anti-Dalits. The protest is justified. I support the protest against the SC/ST Act. I have got to know that some people spread violence during the protests, I strongly condemn it. Our party is not behind the violence during the protests. Strong action should be taken against those who indulge in violence." Adding that the central government is misusing its power against Dalits, "Dalits have been campaigning for their rights. Our party will not sit quietly if their voices are not heard." Additional security force is being sent to Madhya Pradesh's Gwalior, Morena and Bhind, districts in the wake of violent clashes. Incidents of stone-pelting, arson and loot were also reported from several parts of the state during the protest, Inspector General (law and order) Makrand Deoskar told PTI adding that cops were also injured during the agitation. The Tahtipur, Gola Ka Mandir, Hazira and Morar police station areas in Gwalior were brought under the purview of the curfew, a senior official said. Curfew was also imposed in Bhind city, and Mehgaon, Lahar, Gohad and Machand areas of the district, Bhind Superintendent of Police Prashant Khare said. "Two people were killed in Gwalior while one person each died in Bhind and Morena districts during the violence," Inspector General (law and order) Makrand Deoskar said. Curfew was clamped in three districts including Bhind, where the Army was called in to control the situation. Claiming that the SC/ST Act is widely misused and that innocent people were harassed by it, Uttar Pradesh cabinet minister and BJP's ally Suheldev Bharatiya Samaj Party chief Om Prakash Rajbhar extended his support to the Supreme Court's amendments. "The decision of the Supreme Court is absolutely appropriate, as the SC/ST Act is widely misused similar to the Dowry Prohibition Act. Innocent people are harassed in the garb of this Act. A case should be registered only after probe by a magistrate-level officer," Rajbhar told reporters, reported PTI.